We’re starting 2019 off with a bang, with three solar co-ops currently open in Howard, Prince George’s, and Baltimore counties. All three of these co-ops are currently accepting participants. You can find a solar co-op in your area and join today here. Many of you in our Maryland solar movement have participated in the solar co-op process before. 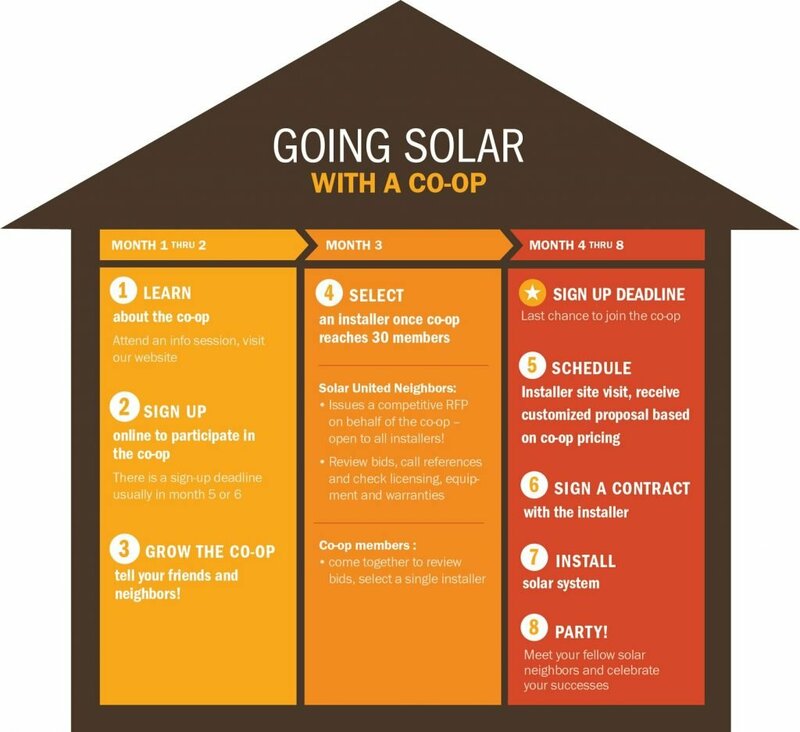 But for those of you who are new to our network, here’s what a solar co-op is and how it works. A solar co-op is a group of home or small business owners in a defined geographic area who use their combined purchasing power to ensure they receive the best value for their solar installation. Solar installers face significant costs finding, qualifying, and educating solar customers. By forming a group of interested buyers, co-op participants ensure the most competitive pricing because Solar United Neighbors has already done some of the work for the installer. More importantly, co-op participants also have access to an installer-neutral and unbiased staff of solar experts to guide them through the installation process and help them understand topics like the value of their solar system, local policies, and financing options. Solar United Neighbors provides educational resources, public information sessions, and one-on-one support for all co-op participants. All co-op participants are able to join the growing movement of solar owners and are keyed into important issues and updates in solar. Our unique co-op process helps ensure each member gets a quality install from a vetted and neutrally-selected installer. What’s more, it costs nothing to join the group! We help each solar co-op develop a request for proposals from local installers, resulting in a competitive bidding process. The co-op participants form a selection committee to review each bid and select which one is best for the group, with the technical guidance and support of Solar United Neighbors. We stay entirely installer neutral throughout the process and the installer selection decision is solely up to group members. We provide support by ensuring each selection committee member understands all the components of the bids and can make a fully informed decision. The winning installer’s bid will then set the price, equipment, warranties, and any additional components for all proposals issued to co-op members. We work closely with co-op participants once the installer is chosen to evaluate their solar contracts and advocate on their behalf during the installation process. Solar United Neighbors provides one-on-one support to any participant who needs additional help and ensures that our co-op members have everything they need before going solar. Once the installer has finished work on the co-op homes that choose to install solar panels, we throw a big party to celebrate the success of the co-op and recognize everyone that helped along the way! The support of our installers, partners, participants, and local leaders makes our co-ops possible. Attend a free information session to learn more!